Agile is the ability of a system to respond to change in an uncertain and turbulent environment. However, it is a path which, according to me, only rigorous and passionate professionals should travel. Agile doesn’t aim to benefit only the product owner or the team – it actually also focuses to benefit the users. Who are the stakeholders of a project? What are the common points of all similar past projects? (for e.g. if a bank finances projects for its business it will do so in a defined scope of software used in their informational system). Business, builders, and QA are the core members of a project. Users, IT, and Quality of Service (QoS) are accountable for the core members’ work, especially users. 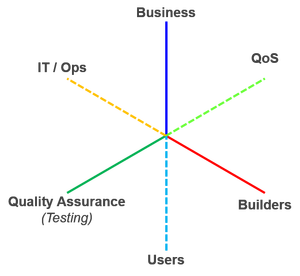 All projects of a customer have several common points. 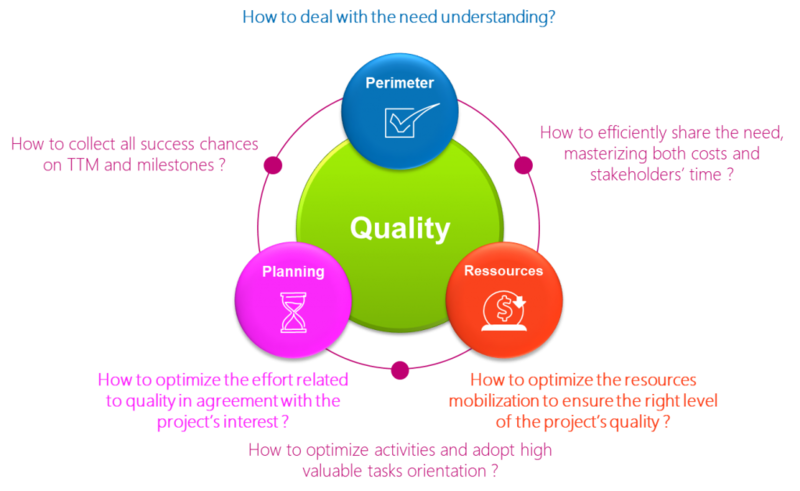 The quality level of a project is the fruit of an equation dealing with a perimeter, planning, and resources. Every project has a quality level. If the perimeter, the planning, and the resources are correctly defined, the quality of the final deliverable product becomes acceptable. If one of the dimensions is underestimated, the quality lacks. Nevertheless, there are two other common points that we can identify. Will use the Informational System (IS) software. All projects, agile or not, can then track both of these referentials. Project requirements or tests cases could link to business. Defects and incident tickers could link to business and IS apps referential. A customer business value referential and it’s combined software referential are two simple dimensions that can provide efficient and very powerful dashboards. This will drastically ease decisions aiming at quality control and IS health. And aren’t all stakeholders accountable for IS health and users satisfaction? This is what I call Agnostic QA. No matter how you plan to do things, everything that really matters is the quality of what you deliver. Agnostic QA is based on the very basic pillars of testing. It brings with it high valuable information that should be followed during testing activities. However, it is also necessary to know the fragilities of the IS apps through business and software to make the project a success. After having lived and studied in different countries around the world, Michel did a Social and economy bachelorate at the CIV of Sophia-Antipolis. After a Master degree in International finance & business in a Business school in 2001, he passed a certificate in Testing project management in 2007 and started his consulting career.